There is a school of thought that encourages people who are in a position to motivate and encourage others, to make a point of trying to catch others doing something right. I’m reminded of this because there was a time when I needed the reassurance of being able to do some things right in order to survive. I think I did, survive I mean, as a matter of fact sometimes I feel like I was born again, religious pun intended. But then, feeling inebriated by the experience of dancing Argentine tango is as close as a religious experience as one can live without having to forgo ten percent of your income to support the leaders of a religious organization, who, by the way, make a point to catch you doing something wrong all the time. No wonder most people wait till they die in order to find peace and joy in paradise. Three of them had names like Elaine, Frankie and Mary. Because of their gracious and generous acts of kindness, I learned not to make excuses for my precarious balance or my occasional bad posture by blaming it on the other person. I have not thanked them enough, I know, and now one of those angels just passed away. I don’t know if I’m mad because Mary missed our Saturday night milonga or because she chose to go to the big milonga in the clouds. Now, she is not coming back, she’s gone forever and now every time I hear La Cumparsita, I’ll turn around hoping to see Mary and Hector Villalba jamming it like they’ve done it many times while Emilio Flores waits his turn on the sidelines to do the same. You may wonder why I’m writing people you probably don’t know. You see, they are (Mary was) tango friends, the kind you encounter every week at the local milonga, the ones that’ll show up every time we give a party or have guests from out of town, the ones we can count on anytime we need them. This is an aspect of the tango that escapes those who because of their selfish, rude and vulgar behavior find themselves trying to catch people doing something wrong or they act wrong themselves creating bad vibes among the people in order to get ahead. When we begin to realize that our goal is not to avoid being caught doing something wrong but to work hard and play harder to create enough situations where others may catch us doing some things right, great things can happen. Like the fabulous party for the people of Tango Libertad, planned, produced and executed with success in mind, or the Welcome to Stanford milonga that brought many members of the tango community together to celebrate the joy and passion of the tango. We’ll miss Mary, because she liked to party. We pray for her soul to rest in peace and we hope her feet will be eternally drawing pretty firuletes on the clouds. And every now and then when they play La Cumparsita, I’ll hope her soul inspires us to continue looking forward to catch people doing some things right. Occasionally unscrupulous performers may hustle students by showing off at a local milonga, however, show dancers in Buenos Aires show up at the milongas to dance with that unmistakable look and feel of the well known and the not so well known Argentinos who dance every beat and every silence of the music with understated simplicity. While traveling abroad these professionals occupy their free time taking ballet or modern dance classes, they go to the gym to stay in shape, they attend yoga classes, they shop and above all, they rehearse every day to be ready to deliver every night a top notch performance. Many who have enjoyed and loved these performances, appreciate the work ethics and the social manners of the talented show dancers. They also value the increased awareness for the tango these shows create. Yet, in some American cities some aggressive women and some insensitive men lie to themselves by professing a passion for the dance and a religious admiration for that unmistakable look and feel of the Argentinos who dance on the floor. Then they fall for the latest fad, they “ooh-and-aah” at the latest contraption that hits the dance floor and they enact their denial by becoming amateur performers on the social floor. This can be very intimidating for those who feel the attraction for the dance at the social level, and annoying for those who are working hard on learning the techniques and methods to circulate on the dance floor; to develop a good and comfortable posture; to feel the floor under their feet; to attempt to master the art of improvisation; above all to care and mind the person they are holding in their arms. These are the people who are missed the most when they decide to stay home. These are the people who form the core of the most enjoyable milongas and the ones who deserve the best music, the best teachers, and the best dance floors. The one who appreciate the best information and earn our deepest gratitude for keeping the tradition alive and letting the tango change their lives without pretending to change the tango. November is turning out to be a banner month for Argentine tango in this country. Take for example the successful run of Forever Tango on Broadway which has already been extended until March 1998. Or look at the sensational US Tour of Tango x 2 through many cities across the nation crowned by a first class stop in New York City for the US premiere of Una Noche de Tango, a brilliant production that pays homage to the generation of milongueros that kept the tango alive through years of fierce competition with rock and roll and a frail economy that almost brought Argentina to its knees. This month a constellation of Tango dance stars are shining bright in the USA tango firmament. Add to that the opening of Sally Potter’s The Tango Lesson starring Pablo Veron, Gustavo Naveira, Fabian Salas, Carlos Copello and Alicia Monti, and the soon to be released documentary Tango: the Obsession by Adam Boucher, a young San Franciscan who spent two and half years capturing the sights and sounds of the men and women of Buenos Aires tango. That’s plentiful enough to be thankful for when the turkey comes to the table at dinner on Thanksgiving day. But, in terms of giving thanks, nothing comes first but our own deepest and heartfelt appreciation to you, who subscribe to our passion and who share our emotions. Month to month, without realizing it, we have crossed the three year mark and we are already one fourth of the way to our fourth anniversary of publication. It all happened because of you, who grew fond of El Firulete, (sometimes you may have gotten jilted by controversy and heated debate, but you recognized our commitment to excellence). In either case, with your support you told us to keep it up, you praised our work many times, you supported our events, and above all you opened your arms to us on every occasion that we had the chance to see each other. So it is proper and fulfilling to say “thanks” to you. This is also a good time to thank all of those who have provided a place so we could all dance and to those who played the music while we danced. Thanks to those who danced with us and to those who danced for us and to those for whom we danced. This issue is very special because it came about across three time zones, from the sunny Golden State to the nippy North East. We are always obsessed with and dedicated to the tango and everything that, and everyone who surrounds it. We believe that the Argentine tango is a living experience and that both young and old have something to contribute. Wherever you might be, we wish you a very Happy Thanksgiving and many good tangos to you and those with whom you share them. A nation that lacks legends, said a poet, is condemned to freeze to death. It is arguably possible. But the populace that lacks myths would be dead already. December is the month anniversary of Carlos Gardel’s birth. Since orchestra leader Julio De Caro also was born on the same day of the same month albeit in different years, the Republic of Argentina declared a few years ago, December 11 as the National Day of Tango. The only memories of a snow fall in Buenos Aires date back to 1918 and 1955, that is why poet Raul Gonzalez Tuñon once wrote about Gardel, “nobody has surpassed his touching voice, on the face of a record or in the rose of the air. Perhaps, when the snow falls again over our city, another voice may come close to match his“. Betty, Julie, Mary and Peggy loved his voice. They were the blondes of New York, “delicious perfumed creatures” kissing Carlos with their “pretty painted lips as if they were fragile pleasure dolls“, in a scene of El Tango en Broadway filmed in 1934. A year later Gardel burned among charred metal on the tarmac of Medellin, Colombia’s airport. Many believe that when he died the myth was born. Of five Argentine myths (presidents Yrigoyen and Peron, Eva Peron, Diego Maradona and Carlos Gardel), only the latter has been accepted by all levels of society. While the errors of the other four were never forgiven and their lives have been questioned and defamed suffering the consequences of political hatred, antagonistic rancor and class discrimination, all is forgiven of Gardel. Writer Horacio Salas points out that “in the same way that nobody in his/her right mind would dare criticize the chromatic qualities of the flag or the literary deficiencies of the National Anthem, the cult of Gardel has elevated him to that same plateau“. In many ways the myth of Gardel identifies the common people of Argentina’s middle class, sons and daughters of immigration. Gardel is the man who made it to the top. He arrived. He conquered. All this in spite of an obscure past and an almost impossible to trace heritage. The second wave of immigrants in Buenos Aires totally identified with the French immigrant who grew up in a conventillo, who experienced segregation, poverty and lack of shelter like those who had to start from the very bottom of the pit in a foreign environment and without a father figure. Through his voice, Gardel went beyond the meager horizon of the slums to become the symbol of the tango song, first in the City of Lights and finally all throughout North and South America. When Gardel sings, and he does it better every day, the dancers stop because The Voice is reminiscent of joy, The Voice is the wail that announces the miracle of a new life arriving to this world. Gardel is born again in the soul of every Argentine that is far removed from the source. Because Gardel is a winning attitude, a posture of arrogance and conquest. Because he has elegance and class, with an irresistible smile, a slick hairdo, shiny shoes and an impeccable wardrobe. 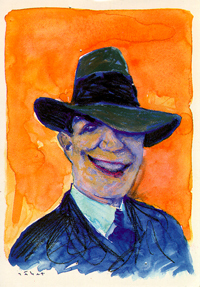 Women loved Gardel, but he never tied the knot, playing the myth and the legend to the end. He was the eternal groom only married to his singing the way a priest marries his religion. He created the ethereal fantasy for the women who fantasize about the day when the idol will become Prince Charming and make their dreams come true. Time flies when you are having fun. Far removed from the stereotypes and clichés that the Argentine tango seems to induce when we first become aware of its existence, learning to retrain our bodies and finding out more about our inner souls, brings about a change in the way we conduct ourselves and the way we restructure our lives. That is, if we are willing to change and assume the new found responsibility of taking care of ourselves in ways that perhaps we never thought of. For the second year in a row, the Labor Day Weekend in Reno, Nevada proved to be the pinnacle of our yearly efforts. That is the time of the year when we engage ourselves with a special group of friends for a weekend long of enjoyment of the tango experience. New ideas flow freely, old and new concepts are put under scrutiny, a fraternal spirit rolls in like a shroud of mystical fog in the middle of a serene ocean. It is like being invited to a major premiere and finding out that you are in it. Soon after that, we embarked on another first time experience. Teaching our dance in paradise. The mere mention of Hawaii in connection with tango tends to make people smile with a “how lucky can you get” look, followed by an accomplice wink that presumes the making of a curro, the lunfardo equivalent of a con job that Buenos Aires journalists are using to describe the plane loads of “tango experts” and “movie stars” that are being auctioned around the country as the second coming of El cachafaz. Indeed we got very lucky because soon after our arrival we met a group of dedicated tango dancers who weekly give up their God given right to sip Mai Tais on the beach, to dress in regulation tango black and put their bodies through the motions of salidas and cruzadas. Returning from ten days in Honolulu without a trace of suntan gave a better insight of understanding how committed a pig really is to the making of the ham that goes along with the eggs for breakfast. It also gave a newer sense of respect for the people who want to learn to dance tango. That sense grew further when we went back to Troy, Michigan and then visited Cleveland, Ohio for the first time. No matter the color of their skins, the accent of their voices, the shapes of their bodies or the level of their education, we met some of the most wonderful individuals and we connected with everyone of them at the intellectual and emotional levels. In some cases it was very humbling to be treated as the cable repairman on a deserted island. It has added more weight to our sense of responsibility to continue bringing to you an honest and fair proposition. We consider it a privilege sharing our personal experience, our love for the tango, and the teachings of the great masters passed along from Petroleo to Mingo to ourselves and to our friends. Nothing new, just the facts, the empowering thrill of knowledge, the good old time religion tenet of earning our daily tango with the sweat of our feet. Many things about tango and the underlying contradictions of the porteños are paradoxical and they can lead to frustration if we approach them with the bias of not accepting possibly complex codes of a culture that they themselves are still trying to understand. It is the educated guess of people who have taken an interest in trying to demystify the dense layers that surround the history of the tango, that the dance evolved over a long period of time. Primarily, people from the lower social strata, more precisely males with plenty of idle time on their hands, found cheap thrills dancing in a different, mocking way, the dances that were typically danced in the society halls and upper class residences of Buenos Aires. Looking at this vignette could lead to thinking that those who mock the Argentine tango dance by introducing “dialogs, conversations” and the juxtaposition of calisthenics against any kind of music, may be the avant garde leaders of the new Tango of the ‘90s. Ha! The guys who danced among each other in times so early that no accurate historical fact can be found, were rogues, scoundrels, rascals, low life who danced with each other to show skill, deftness, dexterity, prowess, who used the primitive forms of the tango as a renewed game of “mine is bigger than yours”. Dancing among men on the street corners of tough Buenos Aires neighborhoods was tantamount to the display of dare and bravado that goes on between gang members in large cities across the United States today. As the city population began to sprawl and the newer generations of immigrants began to send their children to school, the incipient concept of law and order being good for business forced the authorities to ban those street dances because of their rowdiness and the bad element that they attracted. Dancing moved into the houses of ill repute as it continued its development as a show of virility and a form of entertainment that marked the beginning of a form of tango that has defied the pass of time and the changing times in which we live. Men and women embraced to meditate about their individual solitude and metaphysics to the sounds of their city arranged in a beat of 2×4 first and 4×4 much later. For a while, most men gathered to show each other their skills and pass along the growing knowledge in a quest to always be the best, to be admired, to be wanted, to be considered beyond suspicion as a winner. Those who had a steady job, an education, a functional family, learned to dance with older uncles, aunts, cousins, brothers and sisters. Men have not danced together or practiced in seedy bars for over half a century. As the progress changed the cobblestone streets of the barrios into multiple lanes avenues, equality for men and women became an issue, a militancy, a welcome reality that recognizes the values and virtues of human beings regardless of their gender. Today, both men and women have equal access to practice and classes. They both assume a shared responsibility for the quality of the dance. Trying to spin doctor one hundred year old fairy tales to justify the cult of mockery is to take away from meeting the challenge. Growing up in Buenos Aires, one gets used to the onset of winter during the month of July. The days are gray, the wind is unrelenting and the consumption of cold medicine becomes a national pastime. Winter is very cruel on the poor and destitute. As cruel as the catchy slogan “we have to make it through Winter,” coined during one of the many economical crisis that the people of Argentina had to endure, by a government official nicknamed The Pig by the people. Our vision of the world and the life we live is acutely shaped by the amenities of the parental bubble in which we bloom from helpless little “stinkers” to fearless wanderers of a future we hardly know. For years after I left my parents’ home and the neighborhood where I grew up, I kept looking forward to September as a sign that another Winter had gone by and everyone I loved and cared for, had made it through alive and well. Then July became an inconsequential month of Summer up until three years ago when the curiosity for finding out what people did for five consecutive days, eight hours a day during a Tango Week, became a self-indulgent vacation which I allowed myself to take in the wake of the most difficult period of my life. In an incredible turn of events my life changed, better yet, I found my life. I tore up the psychological mortgage that had burdened an existence molded under the prejudices of the past. In the process, new friends and relationships enhanced a new found purpose for living. Amid the renewal of old friendships and the making of new ones, this July became once more a joyful time to celebrate the joy and passion of the Argentine tango, to discuss the pros and cons of interactive lead and follow and to ponder whether it is important in tango to tell the boys from the girls. Then suddenly, the grim ghost of a faraway Winter chilled the air with the incomprehensible news of my mother’s death. Her eyes closed for the last time and the world kept on going. Like in every aspect of our life, somebody, somewhere, sometime had expressed what it feels like when such a loss occurs; more than ever I felt fortunate to know that somewhere in Buenos Aires somebody was a tango poet, and sometime in the past he wrote the words to songs that became the lullabies my mother hummed to cradle her little boy to sleep. But I did not grab the guitar and start singing “my poor dear mother, how many headaches I gave her,” nor did I feel compelled to sing how sorry I was for going away to live my life. Instead, I listened to many of the tunes she used to hum. I tried to bring to mind the time when we danced a tango, when I didn’t have a clue and I couldn’t even begin to imagine that forty some years in the future, dancing tango would be a way of life for me. She couldn’t understand it a year ago. Like most parents from her time she thought of tango as the gate to the wrong life. But I know that she could sense that she’d never seen me as happy as I am. I don’t quite know how to handle the sudden blues that summer time has brought, but those who showed their sympathy and gave me a hug, have made me think that when it is too late to say the words we could’ve said and there is nothing else to give, all that is left, is to let the tears flow.